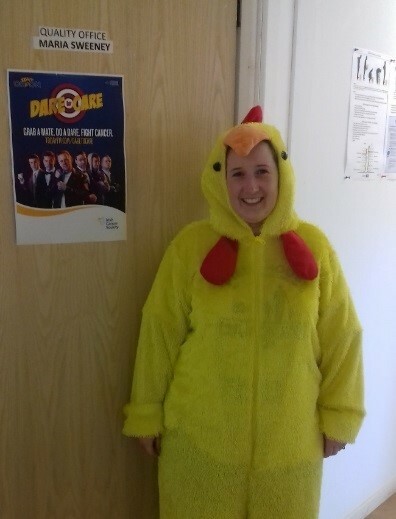 On the 29th September a Staff Member from M11 EJV decided to come to work in fancy dress in Aid of the Irish Cancer Society, as part of Dare to Care 2017. 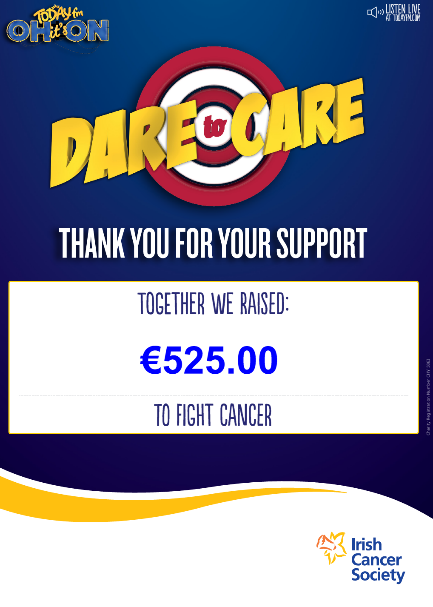 Maria Sweeney, Quality Manager on the M11EJV Project decided to do a Dare as part of Today FM and The Irish Cancer Society fundraising campaign Dare to Care. She had informed all staff in the offices, that she would be coming to work on Friday the 29th of September in fancy dress and in support of her carrying out the Dare, that Staff could make a donation on the day or go to her registered JustGiving page where all money raised by her would go directly to the Irish Cancer society. On Friday Maria showed up in a chicken suit (see Below), it was not what people were expecting her to show up in, but she got a lot of laughs and put a smile on people’s faces for the day. In total she has raised €525.00 and would like to give a big thank you to all who made donations on the day and to the JustGiving page. 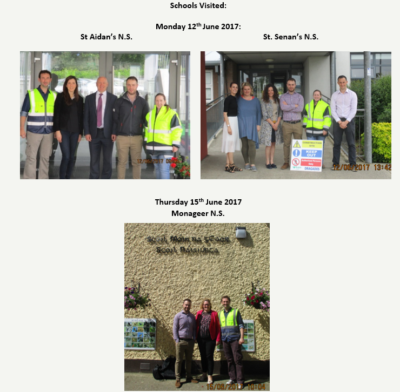 M11 EJV decided to give a Safety Awareness Presentation to the 5th and 6th class children in the surrounding national schools, to highlight the risks and hazards associated to trespassing on a construction site. We also showed them some drone footage of the N80 & N30 Link as it is being constructed, to give them a better idea of the scale of the Project and how big the Plant and Machinery are. Daragh Earle, M11 EJV Health & Safety Officer and Maria Sweeney, M11 EJV Quality Manager. Also in attendance where Yvonne Jones, PPP Co Ltd General Manager, Leo Leonard, M11 EJV Public Liaison Officer and Sarah Sinnott M11 EJV Quality Administrator. Please note that at the time of the blast, sentries will be in place to ensure that no persons wander into the blast area and these sentries will remain in place until the all clear is received after the blast from the shotfire. The M11EJV recognise the importance of working in partnership with the local community, and is committed to employing local workers where expertise and experience exists and offering local suppliers and contractors opportunities from Wexford and adjoining counties. At peak construction over 600 people will be employed directly on the M11 Gorey to Enniscorthy PPP project. Where relevant expertise and experience exists, the M11 EJV and the main contractors employed by the M11EJV try to employ local staff. Between now and the end of construction in 2019, 600 full-time equivalent jobs will be sustained on the project, with most of these being in Wexford. It is envisaged that this will support a further 200 local indirect jobs in the locality. In March 2016, the M11 EJV and our partner employment contractors attended the jobs fair in Wexford organised by the Department of Social Protection in conjunction with the European Employment Services. There we met local candidates who are interested in working on the project and have retained many contact for future reference. Local contractors have already benefited from the project – and have, in turn, contributed significantly to its progress and outstanding safety record to date. Casey Enterprises of Gorey, E&R Warren of Gorey, Bolger Hardware of Enniscorthy, Sean Murphy Civil Engineering of Rathdrum, Alpha Plant Hire of Arklow and Hogan Print of Enniscorthy are among the local companies that have worked on the project over the past year. They have continued to gain safety and quality experience and accreditation putting them in a strong position to compete for other similar projects in the future. The local economy has started to benefit in other ways too as a result of the M11 project. At peak construction, up to 200 people will be living in accommodation locally. Local suppliers are providing products and services to the project, while local restaurants and businesses are beginning to benefit from a significant amount of activity. It will be beneficial in sales for local suppliers such as hardware shops, hauliers, plant hire, cafes and countless other local businesses. The scheme, once complete, will relieve the problem of traffic tailbacks in Enniscorthy which affects so many people going about their daily business and going to and from work every day. It will also free up traffic around Camolin and Ferns and greatly enhance the environments in these areas. As well as the typical quantified economic benefits such as time savings, accident reductions and vehicle cost savings the environmental benefits such as reductions in noise, air and water pollution, visual intrusion, heritage buildings and sites, flora and fauna will also manifest. This will result in substantial positive impact on local communities and additional savings to the local economy. The benefits to the local community continue after the construction phase is complete. Approximately 20 full-time equivalent jobs will be sustained on the project during the operations and maintenance of the motorway and it is expected that a significant number of these will be local.